Natural disasters, health pandemics, power outages, cyber-attacks and other emergencies are increasingly common and could ruin an organization that isn't prepared. You can minimize the risks from emergencies and disasters with this clear and comprehensive how-to guide. 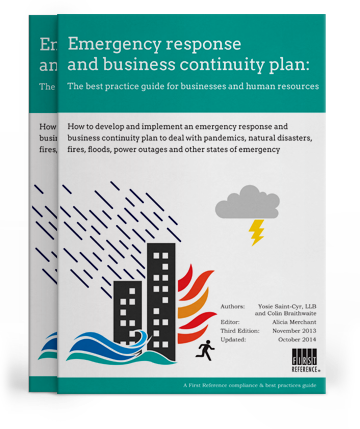 Start developing and implementing your emergency response and business continuity plan today. The risk of an infectious disease pandemic such as Zika or Ebola may be low in Canada, but this current version of the guide provides the information you need to prepare for and respond to an outbreak of any infectious disease emergency. This guide is currently up to date. If a new edition or update of this guide is published within 60 days of your purchase, the PDF version of the up-to-date guide will automatically be emailed to you. Print copies are available at an additional charge.